Insight Bureau: Are Political Parties serious about Farmers’ plight? Or, are they just playing politics? Laxmikant Rout: I don’t know much about intention of the political parties here, but all of them know better which issues to be escalated tactically to gain votes. While BJP raking up farmers’ issues aggressively in non-BJP ruled states, it has failed to perform in the states where it’s in power. Even, at the central level, no great work done yet. Chakradhar Sarangi: No. Only vote bank politics…Crocodile tears… Somehow we are also responsible. We raise our voice when potato prices increased, but nobody bothers when quantity of wafers are reduced in Lay’s packet at the same price. Farmers should get real value of his product. And, it should be done without any exception. Debendra Rout: Agriculture is the backbone of our economy. Without developing agriculture sector, we can’t imagine the development of the whole economy. 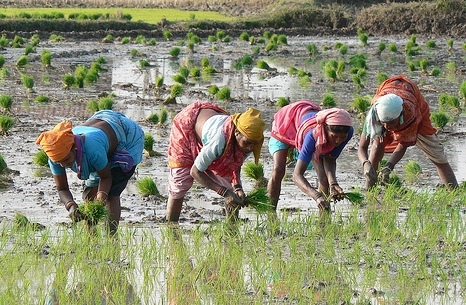 As far as Odisha economy is concerned, we have to develop an agricultural policy for the state. Has any Govt tried to develop such a policy? A couple of proposals have been sent by different organisations and individuals but no work has been initiated. Personally I have sent a proposal to both central Government and state Government relating to agricultural marketing, institutional credit and rural unemployment. If it is adopted, then rural economy will be self dependant up to some extent. I’m eagerly waiting for action. The action of the government can indicate how serious they are to address the problem of farmers. Tusarkanta Satapathy: As long as elections remain expensive, this problem will continue. All fund givers will extract their pound of flesh through adulteration of seeds, fertilizers and pesticides. While bribing voters needs to be stopped, Agricultural Extension Officers in villages must be alert and spread awareness among the farmers. Prasanna Kumar Parida: No…Except former PM H.D. Deva Gowda, no other governments or leaders are serious about farmers’ plight. Mamata Rani Barick: Politicians prefer to give speeches when in power; they use farmers for their political gain. But, nothing changes on the ground. Santosh Mohanty: Yes, they are playing nasty politics as always. They don’t care if farmers or any others die. Politicians adroitly manage things to accumulate wealth for themselves as their kin. Gyan Ranjan: Politicians lack concerns and focus for Agriculture. While its contribution to GDP reducing with time, no govt in recent past paid any serious attention to it. The poor farmers continue to languish, while politicians seek to gain sympathy and votes. Ranjan Kumar: No ….No one is thinking about farmers. They are doing only politics on that, especially BJP. Biswa Nandan: Absolutely not. By debating on the suicide of farmers and indulging in blame game, the government and opposition are making a mockery of farmers’ plight. The entire process of agriculture must be rigorously examined by the agricultural experts. Or else, farming will suffer more. Lipsa Rautray: No… They just need political agenda for votes. And farmers’ issue is quite easy to raise and play politics. Jagannath Satapathy: Almost all political parties behave like the other side of the same coin. They do not come with a clear long-term vision to deal with the problem. Frustration continues for farmers in Odisha to Maharashtra. Without playing the blame game, both Governments at Centre and state could have done something more irrespective of their party affiliations. Bijoy Rout: No. Not at all… They are only shedding crocodile tears to gain popularity. Jatindra Panda: It is a vote catching gimmick. If anyone is serious, let them watch the progress of disbursement and list out the non-performing non-perishable assets and prepare a register of assets and conduct concurrent evaluation and monitoring. There should be a proper monitoring of bankers in remote areas and justice must be delivered to the farmers. Biswaranjan Behera: They are only playing politics. Nobody is serious about farmers’ cause. Jagadish Pradhan: Yes,political parties are serious about farmers’ plight. But every party is busy taking mileage. Ironically, political parties do not urge the farmers not to commit suicide and offer solutions. It’s a shame! Yudhistir Pradhan: In one line, no political party is heartily committed to our farmers.